I finally got all of my beauty subscriptions in for the month of May! My Ipsy bag definitely took the scenic route on its way to me and kind of held up this post. Regardless, I have three beauty subscriptions to show you this month to help you determine if you want to subscribe to any of these services. 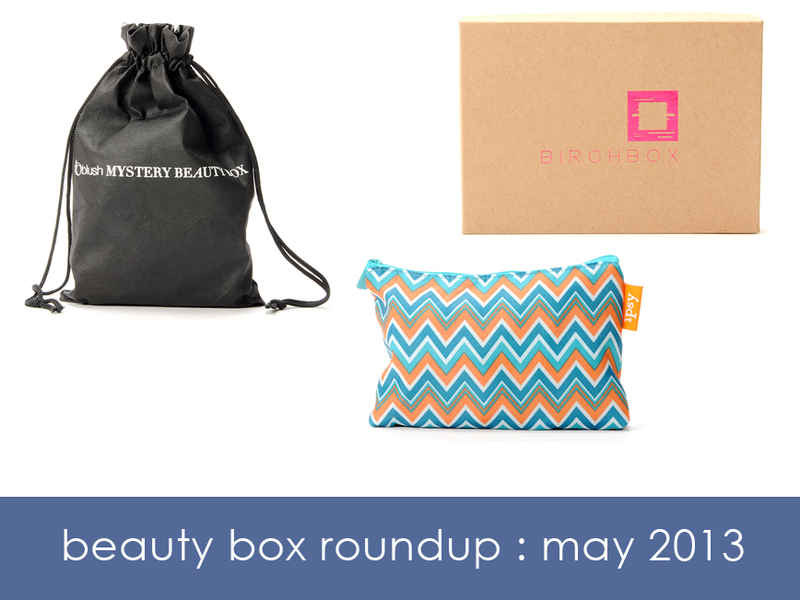 Keep reading to find out what I got in my Birchbox, Blush Mystery Beauty Bag, and Ipsy bag and their cash values. Here are the contents of my Birchbox; Folle de Joie eau de parfum, Beauty Protector leave in conditioner, Supergoop! 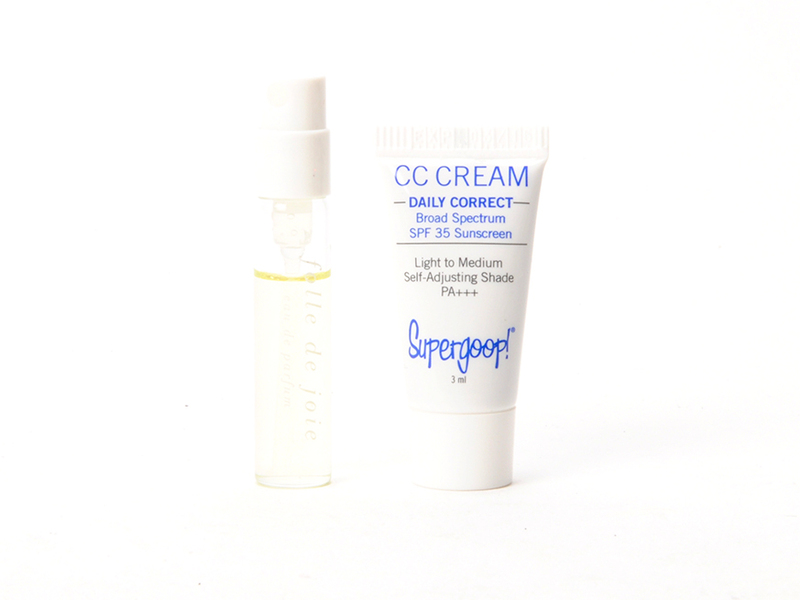 CC cream in light/medium, Soleil Organique Sunscreen Stick, and Weleda Body Lotion. The Folle de Joie, which was in the white cardboard, came with a spray top (thank god, I hate it when they just put a stopper on it). I put these two samples together so that you could see how small the Supergoop! sample is. I've already used it once and I'll probably end up getting another 2 uses out of it, but it's pretty tiny. It also irritates me that it's only 1 ml more than the eye cream that I sampled last month. For a product that is meant for a small area, like the eyes, a small sample is fine, but this is meant to cover my entire face. It's just seems really... cheap. And again for size comparison, here is the Soleil Organique sunscreen stick with the lid removed. The Beauty Protector is a good size and so is the Soleil Organique; these two definitely fall in the deluxe sample size. Like I said up above, this just seemed like a really practical box; like when your mom gives you socks and underwear (and not the cute kind) for Christmas. The other thing that really bothered me about my box was how small everything was. The sunscreen stick is actually a full sized item, but it's... a sunscreen stick. The Supergoop! sample is very small and I got three foil packets of lotion. I know foil packets are a huge complaint for Birchbox subscribers and it's been a long time since I got a box with them. Anyhow, I'm pretty underwhelmed by the box, but I will get 50 Birchbox points from my reviews of the items, which is the equivalent of $5. Oh, and a side note, my Beauty Protector nozzle doesn't work even after trying several ways to remedy it. I emailed Birchbox about this and I have to say that their customer service is one of the biggest redeeming qualities for them. I got an email back in about 24 hours and they offered to send me a new bottle of it. I also know that if they had not have any more samples, that they would have offered me 100 Birchbox points. I actually ordered two Ipsy bags this month because I thought that they were so awesome and that's definitely the first time I've ever done it. I'm only going to review the one on my main account since the other one is an extra and I already knew what I'd be getting in it. And here are the contents! 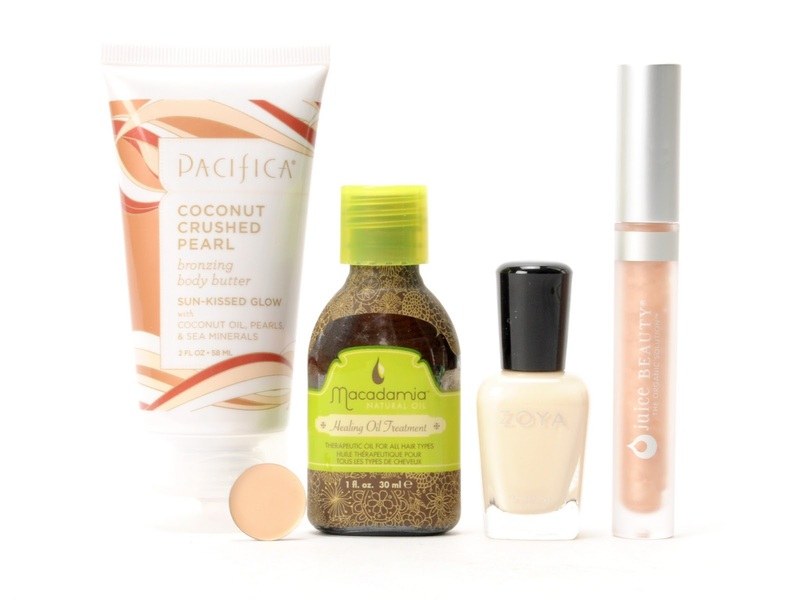 From left to right, we have: Pacifica Coconute Crushed Pearl Bronzing Body Butter, Yaby concealer in Buff, Macadamia Healing Oil Treatment, Zoya nail polish in Jacqueline, and Juice Beauty gloss in Champagne. 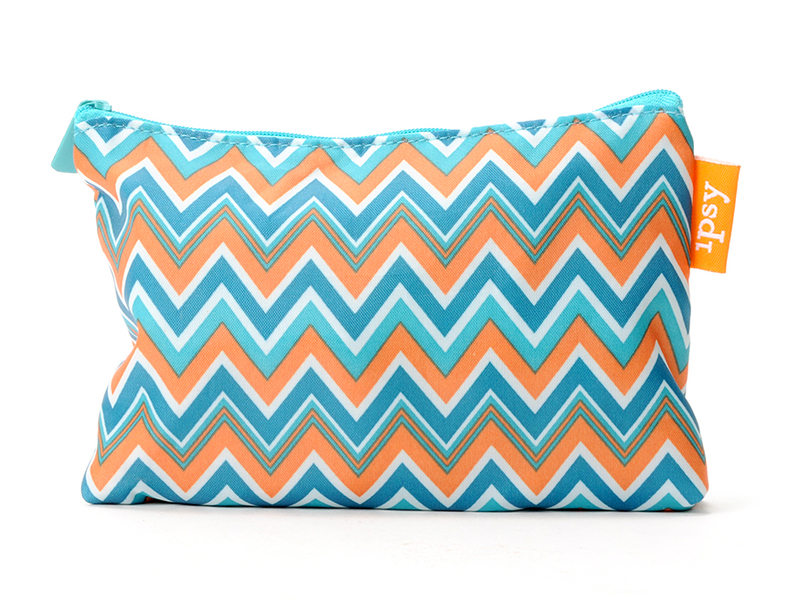 Ipsy went out on a limb this month and started doing bag variations, which really pissed some people off, but I kind of enjoyed. They've also updated their beauty profiles and they are much more in depth than they used to be, meaning that future bag variations can be tailored more toward each subscriber. It kind of amuses me that I got so much neutral colored stuff since my beauty profile has said from the beginning that I am adventurous when it comes to makeup, but I actually really like all of my neutral items. This is the Zoya nail polish color that I wanted and as much as I hate lip gloss, this one is really cool; it's much more natural than other brands and therefore, not sticky at all. I already had a bottle of the Macadamia oil, but like I've mentioned before, I'm growing my hair out, so it'll be very useful. The concealer is a bit dark for me, but I might be able to use it in the summer and the lotion deposits a bit of color that washes off in the shower. 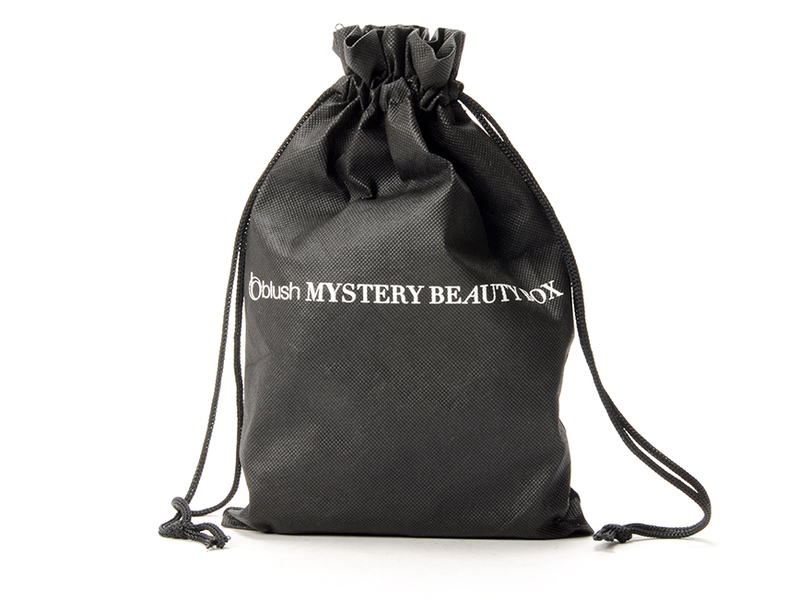 And my newest beauty subscription, the Mystery Beauty Box from blush.com. In case you missed my last post on this, the "box" is $24.95 if you subscribe monthly or $34.95 if you buy it once. They claim that each month is worth of $100 and it's a mix of makeup, hair, and skin care (kind of like Birchbox). Blush.com also does a little sneak peek each month in the form of a video on their site. I knew that I would be getting two of the items that came in here and the rest were a mystery. The contents! From left to right, we have: Nick Chavez Advanced Volume Conditioner, Bauble Bar mystery bracelet, Cailyn Cosmetics Lien-Fix Gel Eyeliner, B. Kamins BB Cream, Cotz Face Natural Skin Tone SPF40, and Skylark Wild & Free Mini Nail Lacquer set. This month brought some changes with this "box" (because really, it's a bag); they put all of the products in a branded bag and they included a card with information on all of the items... which I wrote all over, so I didn't photograph it. Just like normal, you get a free sample with your beauty box and this month I got a sample of Vichy anti-cellulite lotion which came in a foil packet. I'm pretty impressed with this box again this month and even though I haven't heard of all of the brands, if I need any info on the products, I can just go to blush.com's site and read a ton of reviews for each one. Something about that makes me feel slightly more confident going in. The Skylark polishes are actually made by some YouTube beauty gurus; Allthatglitters21 and Juicystar007; also known by their real names, Elle and Blair Fowler. This is the bracelet that I got and I'm kind of in love with it. I have a passion for skulls and I have had one for a loooong time, so this is just a lovely addition to all of my skull and anatomy jewelry. I also like Baublebar and ordered from them when they first opened a few years ago. When I placed my first order, they hand wrote me a note thanking me for my order and gave me several discount cards. I don't order jewelry all that often, but I have several pieces from them and I enjoy all of them. And, on this note, I actually got two bracelets in my bag, which is a mistake (same bracelet, just two of them), but a happy mistake at that. 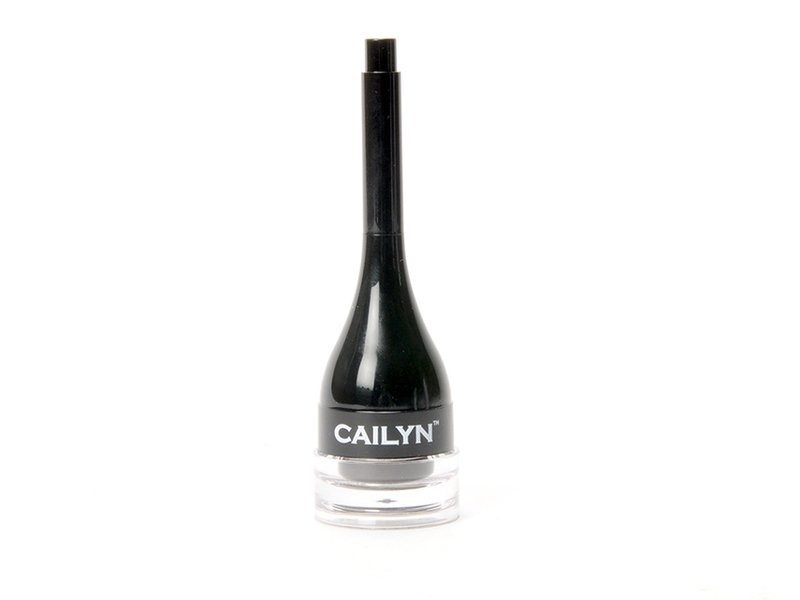 This is the gel liner out of its box so that you can see it in all its glory. I've seen a lot of companies starting to put the brush in the cap of the liner; it's a nice idea for those that don't own a lot of brushes, but I prefer to use a thinner liner brush. I got this in Fall Mood which looks like a dark brown in the container, but it dries to be almost black. Baublebar Bracelet: These specific bracelets are sold out right now or something, but I know that the skull bracelet is between $18 and $20. Just a side note; the only sample in this that irritated me was the Cotz sample. There's really only enough for one use if you use the recommended amount of sunscreen, being able to get two uses would have been a bit better so that you could see how it might actually work. So, those are the beauty boxes for this month! What do you guys think, want to subscribe to any of them? If you do, you can use my referral links listed below or check it out on your own! Hi! Discovered your blog when I saw your tutorials on reddit.com/r/beautydiagrams. Just wanted to say you have a nice blog and I'll be following it! I like this entry haha please do one every month.